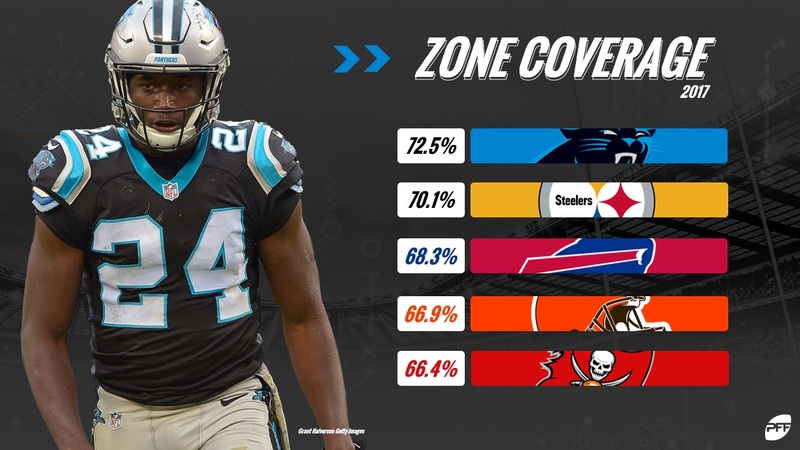 Man vs Zone – who ran each coverage scheme the most in 2017? As Teaching Month continues here at PFF, we’ve turned our attention to coverage this week. Yesterday, PFF Analyst John Kosko brought you the prototypes for key positions and roles in the defensive backfield and today we switch focus to the team level and which teams run specific schemes most often. We began collecting coverage scheme data for our NFL clients back in 2015 and while there are always variations, there are two common big buckets that schemes can be grouped under. With that in mind, here’s our look at which teams ran which coverage schemes most often, and how much success they had. 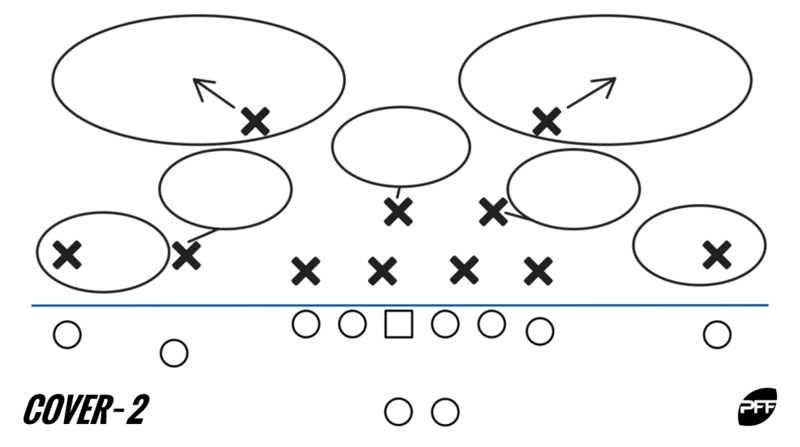 Broadly, Cover-0, Cover-1 and Cover-2-man are considered man-coverage schemes, while Cover-2, Cover-3, Cover-4 and Cover-6 are more zone schemes. There are of course variances and also coverages in which change in the redzone and near the goal line. For sake of this article, we will focus on those broad buckets – man versus zone. 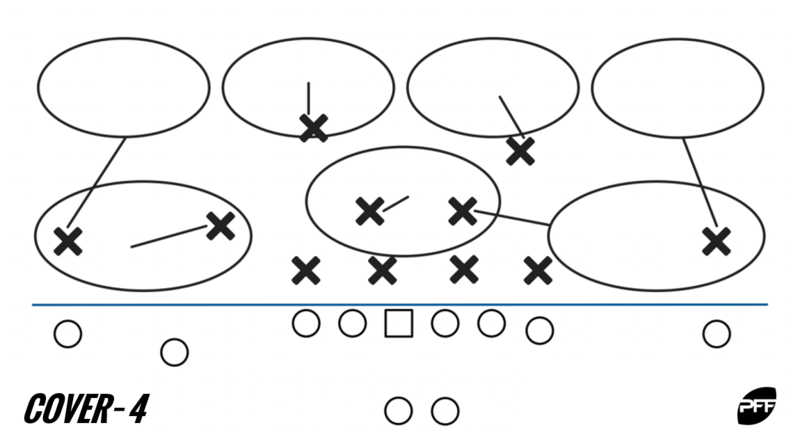 The primary man coverage shell, Cover-1 leaves a single-high safety as a safety net on the back end, with the cornerbacks manning up against the receivers in front of them. 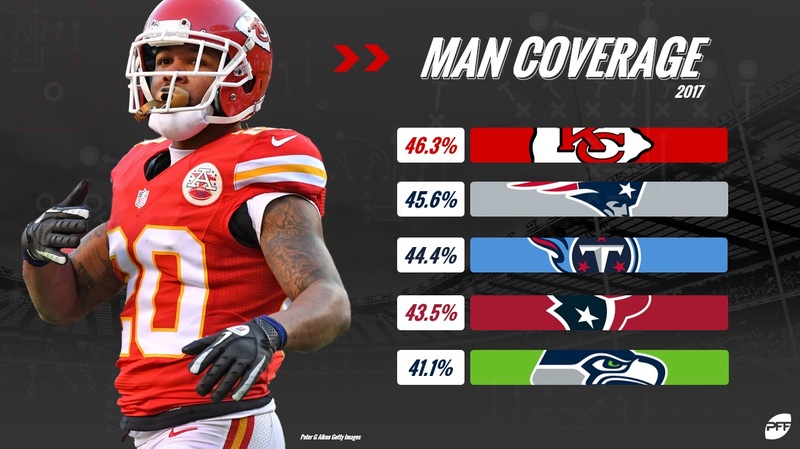 No team ran more predominantly man coverage schemes than the Kansas City Chiefs in 2017, and more often than not they went with Cover-1, using it on 43.2 percent of their snaps against the pass. On those plays, they allowed 57.2 percent of passes to be completed and while they allowed five touchdowns, they also came away with five interceptions. By completion percentage allowed, the Pittsburgh Steelers were the best defense in the NFL when they ran Cover-1, allowing just 44.8 percent of passes to be completed, but they ran it on just 13.4 percent of their snaps against the pass. Cover-0 was used much less than Cover-1 and the reason for this is simply because it is much more risky. With no safety net over the top, it exposes the defense to big plays if things don’t go to plan. The Super Bowl Champion Philadelphia Eagles were the bravest team in the NFL in this regard, using it on 6.1 percent of their snaps against the pass, but from just 43 dropbacks they allowed five touchdowns (11.9 percent). That touchdown percentage might seem high, but it pales in comparison to the Atlanta Falcons, who allowed a touchdown on all three occasions where they went with Cover-0. The small sample size doesn’t help their cause, but it’s not ideal to allow a touchdown every time you line up in a specific scheme. 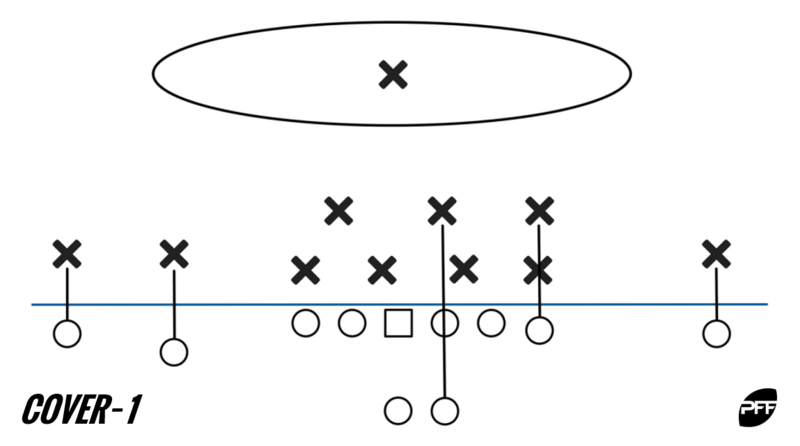 When we think of Cover-2, we immediately think Tampa-2, the scheme made famous by the Tampa Bay Buccaneers. Here, the safeties are responsible for covering the deep halves of the field, while the ‘Mike’ linebacker will drop deep from his spot in the middle of the field to cover any inside seam routes. The Cleveland Browns were the only team to run this coverage on more than 20 percent of passing plays but allowed a 73.2 percent completion rate on those plays. The Los Angeles Rams used Cover-2 on just 5.3 percent of passing plays, but allowed an NFL best 37.9 percent completion rate. Cover-3 splits the field into deep thirds, with the free safety taking the middle, and the outside cornerbacks dropping deep on either side. 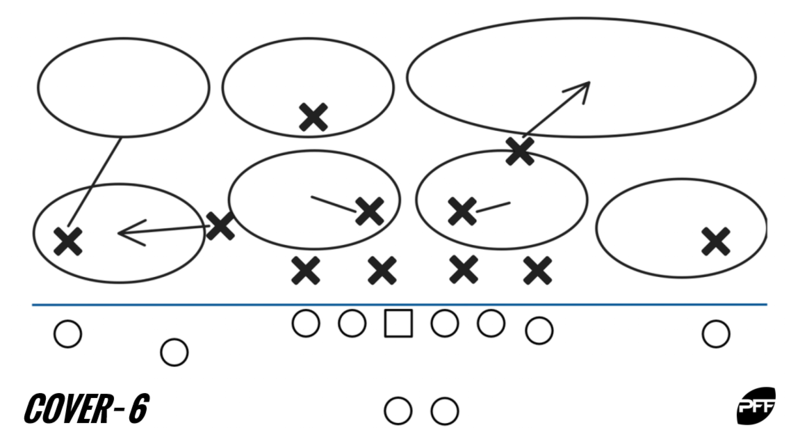 This allows the defense to put eight men in the box using the strong safety, so is something we often see on earlier downs. The Atlanta Falcons led the NFL in using Cover-3 on 46.4 percent of their plays against the pass, but the number dropped from 53.0 percent on first down, to just 37.2 percent on third down. Overall, the Cincinnati Bengals had the most success when running the scheme, allowing a league low completion percentage of 52.9 percent, with zero touchdowns allowed and three interceptions. Often known as quarters, Cover-4 sees two deep safeties and two deep corners split the field into, you guessed it, quarters, and was used most often by the Tampa Bay Buccaneers in 2017. Running the scheme on 27.3 percent of their snaps against the pass, they allowed a completion rate of 65.8 percent, with seven touchdowns and three interceptions. The Green Bay Packers allowed the lowest completion rate when using Cover-4, coming in at 47.8 percent, but used it on just 4.9 percent of snaps. The naming conventions for the coverage schemes so far have been fairly self-explanatory, with the number coming from the number of players responsible for the deep part of the field. 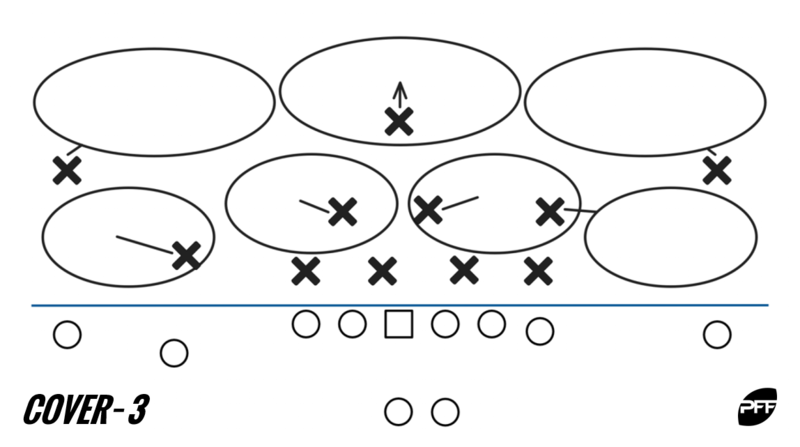 Cover-6 goes against that convention and doesn’t mean that the deep field is split six ways, but rather is a combination of Cover-2 and Cover-4, so on one side of the field a safety takes a deep half, while on the other side a cornerback and safety each take a deep quarter. The Chicago Bears ran this significantly more than any other team in the NFL, with their 16.4 percent usage topping the Rams (12.9 percent) in second place. The Bears did allow a completion percentage of 65.2 percent here, but from 103 snaps against the pass in Cover-6, they allowed just one touchdown over the course of the season.